In 1977, at the dawn of the punk movement the Misfits set out to make an impression, and created a legacy that has truly withstood the test of time. Immortalizing black and white B horror films in their music, the Misfits developed a ghoulish and totally unique persona that’s consistently evolved, while remaining true to its roots. The band’s iconic “Fiend Skull” logo has become a staple in pop culture, and an instantly recognizable symbol worldwide. Bands across the spectrum of rock have covered their material, including Metallica, Guns ‘n’ Roses, My Chemical Romance and countless others citing the ‘Fits as a key influence. Boasting a massive catalog of music, a new lineup, (consistently helmed by founding member Jerry Only), and an influence felt around the world, the Misfits are generating more interest today than ever before. With new releases charting higher than all priors, and constant worldwide touring, their diverse demographic and legion of “fiends” (as their fans are affectionately known), multiplies daily. The band’s last full length release, 2003’s “Misfits Project 1950,” showcased punk covers of 50’s era classics with special guest appearances by Ronnie Spector, Blondie’s Jimmy Destri and many more. Only, who had the project in mind for many years, says, “The backbone of punk has always been the 3-chord progression which was ultimately inspired by classic rock and roll of the 1950’s. I had always wanted to record some of the music that inspired the Misfits, to show fiends where it all began.” Released independently on the newly formed Misfits Records label imprint, the CD debuted on Billboard’s Heatseekers Chart at #2, and Billboard’s Top Independent album chart at #5. Notably the highest charting release in the entire 30-plus year legacy of the Misfits, “Project 1950” also marked the first full-length release to feature Jerry Only on both lead vocals and Bass, with former Black Flag alum Dez Cadena on guitar. 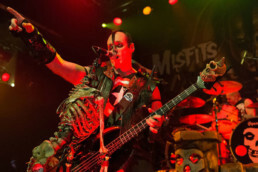 Today, The Misfits remain more aggressive, more topical and more sought after than ever before, fronted by Jerry Only (Bass/Vocals) with Dez Cadena on guitar, (celebrating his 10th anniversary in the band this year), the latest addition to the fiendish fold is drummer Eric “Chupacabra” Arce behind the kit. Arce, or “Chupacabra” as he’s now known, has been a fixture in the ‘Fits touring lineup for over a decade, and recently inducted a permanent member upon the retirement of original Misfits drummer Robo, who’d passed the torch in 2010. Now, the ‘Fits return with their first full-length release of all-new, original material in nearly a decade! Rooted in the horror and sci-fi themes their audience craves, “The Devil’s Rain” showcases 16 fiendish, soon-to-be Misfits classics including “Twilight of the Dead”, “Dark Shadows”, “Curse of the Mummy’s Hand” and the title track “The Devil’s Rain”. Produced by Ed Stasium, (who’s credits include the Ramones’ “Road to Ruin” and “Too Tough to Die”, as well as the Misfits’ 1999 release “Famous Monsters”), the album showcases a jaw-dropping, twopanel front/back cover painting featuring the rebirth of the band’s iconic “Fiend” mascot in an epic setting rendered by Arthur Suydam (known for his immensely popular work on the Marvel Zombies series, among others). The packaging, designed to emulate a CD sized gatefold LP, also features some incredible new Misfits portraits shot by the legendary Mick Rock. Rock’s imagery has become part of the very fabric of rock ‘n’ roll. Having also served as an on-set photographer for cult-movie classic “The Rocky Horror Picture Show”, Rock lends a perfectly suited eye to view the band’s surrealistic and highly theatrical persona. “The Devil’s Rain” is not just a continuation of a historic legacy, it’s a total reboot ushering in a new era of terror. In a sense, it’s the debut album from the legendary Misfits of this decade. From fans of their classics, to newcomers discovering the band for the very first time, “The Devil’s Rain” sets the bar, and redefines the ferocity and melody that has made the Misfits omnipresent and immortal. Copyright 2017 Artists Worldwide. Web & Graphic Design by Rockstar Pixel.